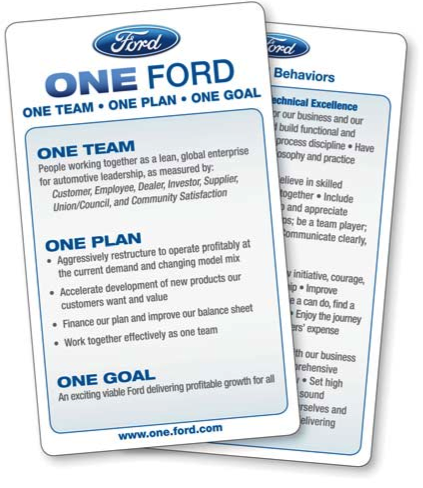 Ford Motor Company’s plan may appear to be “radical surgery.” However, while One Ford contains the articulation of Ford’s vision and plan in relation to current reality, the accompanying list of expected behaviours sets One Ford up for ongoing “health maintenance,” and the accommodation of future realities. Articulation of vision and plan can be relatively simple. Articulation of expected behaviors (eg: team charter, cultural practices, code of conduct) is generally more complex. Behaviour is cultural. Cultural change takes time. It includes the adoption of language and the maturing of human behavior. Partnership requires the engagement of others in a spirit of trust and respect. Trust and respect requires that our behaviour is consistently predictable and appropriate in relation to our partnership’s stated vision and values. Articulation must be followed up with accountability, and this must apply to ALL who are identified as stakeholders within the partnership; first with the leader, and then the employee. Each has the need to know how they are functioning within this accountability. This principle can be accommodated within annual and semi-annual performance reviews. Each employee could receive a grade of below, average or above- average in relation to the employee’s peer group for each of the expected behaviors. Ultimately, clear articulation provides a solid foundation for discussion. It should be expected that all stakeholders are committed to the overall health of the organization. If all are not committed, then they should no longer be stakeholders. “I don’t get” it refers to the clarity of specific task or process in relation to overall mission and vision. “It doesn’t feel right” refers to issues of individual personality fit and/or values match. “I don’t know how” refers to issues of experience and/or training. Partnership could be defined as where we stand for each other’s success. Engaged employees facilitate corporate success. Engaged leadership facilitates engaged employees. Leadership must courageously engage dialogue with employees to discover their reality, and unselfishly help them to succeed as individuals. It is not appropriate to hold people accountable to specifics where maturity will not be supported through resources, time and encouragement. One might wonder if this depth of change (maturity) would lead employees to feel burdened. Maybe the concept is too overwhelming to explore practical application. Okay, so Ford has navigated a significant restructuring challenge with engaged employees and significant bottom line results. The clarity of One Ford seems to be working to produce high performance, but will it last? Is it sustainable? Only time will truly tell. There are many complex variables involved in business, but I believe that if they stick to honoring their partnerships, and holding themselves accountable to their “expected behaviors,” they will continue to perform well.